On the 31st of March, we introduced human flight company Gravity to the world. Here’s a case study of how that went, but if you follow us on social media… chances are you’ll know. It went *pretty* well. On the same day, we noticed Craig Glenday – the editor of the Guinness Book of Records – followed @TakeonGravity on Twitter. He’s Kind of a Big Deal. Now, my mum has bought me the book for my birthday every single year, since I was about 13. I’m 30 now. Never could I have imagined then that we’d be working with them, but – I’ll get onto that. I’m getting ahead of myself. We sent Craig this direct message, which sparked a months-long chat. Launched to celebrate the day in 2004 when Guinness World Records became the world’s bestselling copyright book, International Guinness World Records Day 2017 saw more than 600,000 people around the world attempting to secure their place in the history books. After lots of back and forth (and talk of racing a very, very fast man you might have heard of), for this year’s International Guinness World Records Day, the team wanted Gravity to set the flagship record to promote the day around. It was decided – founder Richard Browning would attempt to set a record for ‘the fastest speed in a body-controlled jet engine power suit’. There wasn’t one to break, given the nature of the attempt, but the stage was set for something special. And Richard delivered. 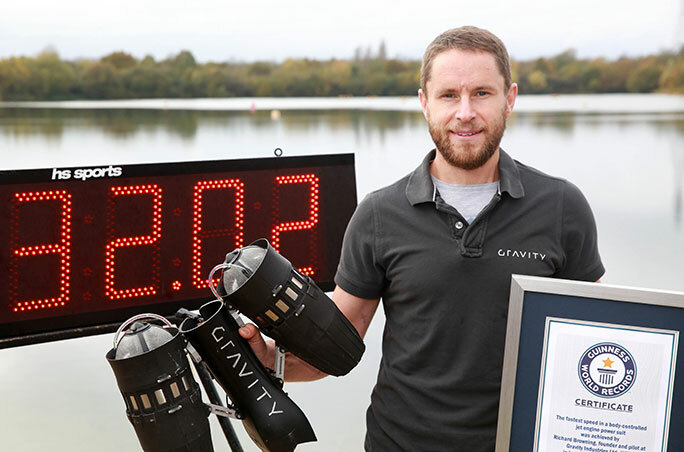 Here’s the video of him quite literally zooming into the record book, clocking 32.02 mph (51.53 km/h) on his third and final timed attempt. The record made global headlines, and certainly kept us and Guinness World Record’s media team busy for a few days! We’re talking about thousands upon thousands of pieces of print, online and broadcast coverage, reaching millions, if not billions, of people worldwide. We’re still collating the results from that and social media, and will add them in when done. Read more about the incredible record on GWR’s site here, and keep an eye on our and Gravity’s social media profiles (Facebook here) to hear how things progress. Let’s just say, the innovation isn’t stopping any time soon. PR insight: what kind of business bump does 15 minutes on Dragons’ Den give you?